I loved how unique this book of poems was. Anyone that has ever dealt with grief and self-doubt will get a lot from this. The idea of setting each poem to a song was brilliant. Of course it worked a lot better for me when I was actually familiar with the song. For this reason I think it would be a cool idea if the book came with a cd of its playlist, or if in the audio version the poems song played after each poem. There are many books that I have loved, but few that felt like they were written just for me. The writing was beautiful without being flowery, raw without being harsh. The author feels like a kindred spirit. These poems make me want to cry and smile at the same time. 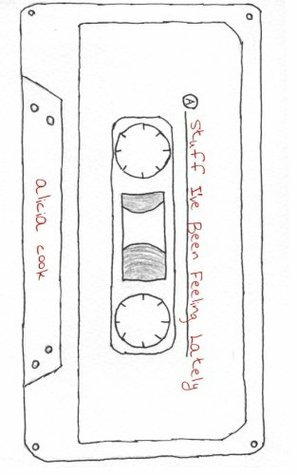 Alicia Cook is a master in the balancing act of bittersweet prose. The only thing that was a little disappointing for me was that the black-out poetry in the second half of the book was not visible at all in my advance reader copy. I know this is not an issue in the finished work so I won't take off a star for that. I am just sad that I couldn't fully experience this book of poetry, but even just the first half of the book was worth five stars to me. This is poetry for everyone. Well done Ms.Cook. Sign into Goodreads to see if any of your friends have read Stuff Ive Been Feeling Lately. Thank you so much for this amazing review. I am so glad you enjoyed the new edition! !